Description: Students of the First Liceo had worked with patterns based on hexagons and octagons in Middle School. 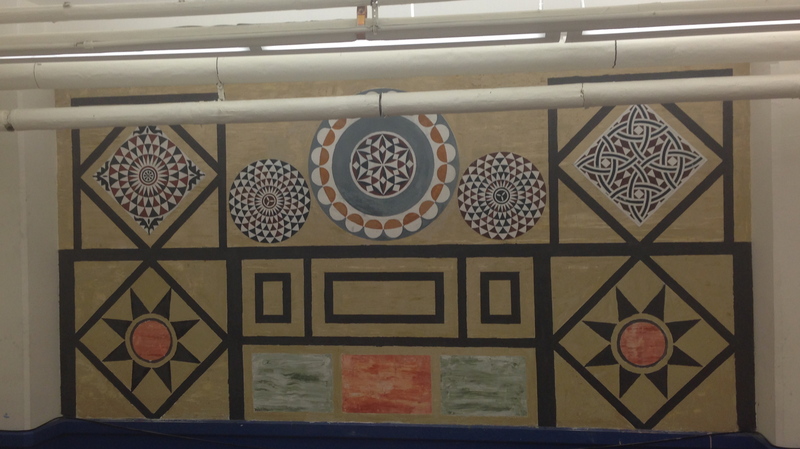 Earlier this year, they did an Islamic pattern based on the dodecagon. Inspired by the beautiful geometric forms on the facade of the cathedral in Pisa, they decided to do an interior design project inspired by those motifs. They also incorporated some elements from the baptistry in Florence, which is contemporary with the Pisa Romanesque. Description: The students of the Second Liceo were inspired by the unique Sinopie Museum in Pisa. 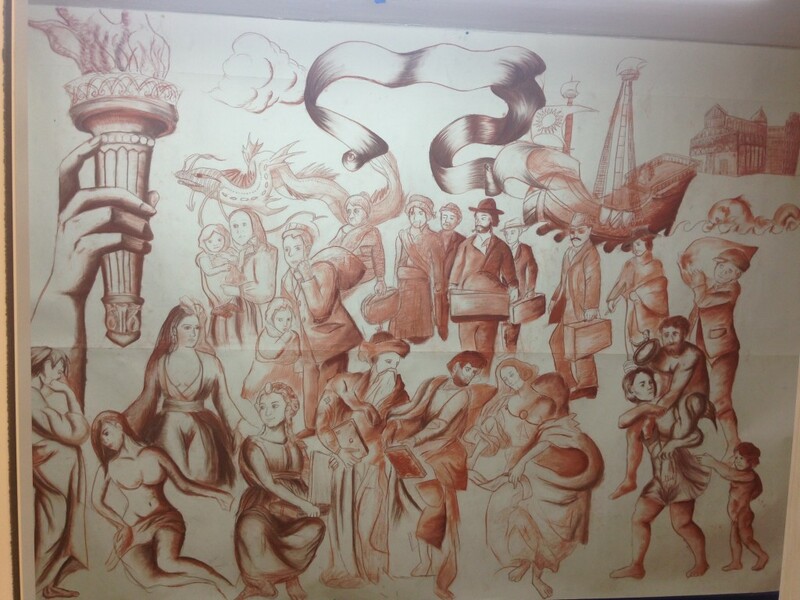 They decided to create a mural in this style: they wanted it to be about America, but they also wanted it to be allegorical, in the tradition of the Middle Ages an Renaissance. What follows is a description of the mural. Like the rest of the world, America is largely an immigrant culture. On the lower right we see Aeneas carrying his father and leading his son, as they flee their homeland for a new start in a new land. I wonder, where will his journeys will take him? We also have Italian immigrants arriving at Ellis Island. Of all the cities that could symbolize the Old World, we chose Pisa, whose distinctive architecture represents the pinnacle of medieval European culture. We must not make plaster saints of the great explorers. They were men of their age, it is true, but it was an age preceded by that of Jesus Christ and the Buddha. Without turning a blind eye to their flaws, we must nevertheless acknowledge the daring of Columbus, Vespucci, and Magellan, all great sailors whose adventures transformed the world. The Statue of Liberty in its entirety is too cliché an image, but the hand holding a torch is not only a beacon of hope for immigrants around the world, but also a symbol of the Enlightenment, upon whose principles the country was founded. The ideas of the Enlightenment are sound. Unfortunately, the words of men like Locke and Jefferson remain more an idea than a reality. Beneath the torch are the four continents: Asia, America, Africa, and Europe. New York City is the great melting pot, but we must not whitewash our history. The Chinese Exclusion Act was a United States federal law signed by President Chester A. Arthur on May 6, 1882, renewed in 1892 and made permanent in 1902. The Chinese Exclusion Act was the first law implemented to prevent a specific ethnic group from immigrating to the United States. It was finally repealed by the Magnuson Act on December 17, 1943. The Emancipation Proclamation was a presidential proclamation and executive order issued by President Abraham Lincoln on January 1, 1863. It proclaimed the freedom of slaves in the ten Southern states that were still in rebellion. The Trail of Tears commonly refers to a program of ethnic cleansing and forced migrations of Native American nations in the United States following the Indian Removal Act of 1830. Women’s suffrage in the United States, the legal right of women to vote, was established over the course of several decades, first in various states and localities, sometimes on a limited basis, and then nationally in 1920. Final comment: “Committee Members all expressed admiration for the originality of the work and the high quality of its execution. While the work makes important allusions to Pisa’s rich artistic heritage, it is not entirely in line with the theme of the contest. A more explicit connection to the Pisan Romanesque Style would have guaranteed even higher placement”.